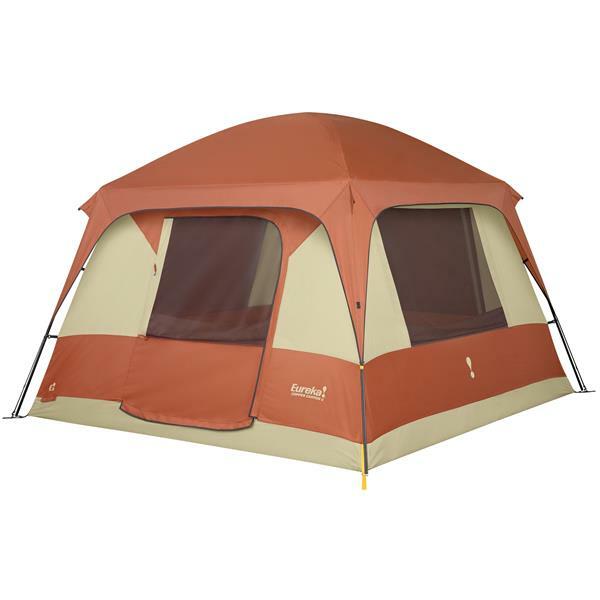 When you can't build an actual cabin out in the great outdoors, get the next best thing with the roomy and comfortable Eureka Copper Canyon 6 Tent! With lots of room for up to 6 happy campers, the Copper Canyon features a free standing and shockcorded fiberglass and steel frame that's easy to set up and four windows for ventilation and panoramic views of the scenery. One big door makes getting in and out a breeze and the included gear loft helps keep your essentials organized, while the zippered E! Power Port lets you run in an electrical cord to power all your gadgets. Don't sacrifice your comfort to appreciate nature this season when you have the Copper Canyon! Pack Size: 8" x 26"
Matching yellow webbing on tent and fly couple with the ring and pin assembly to make set up fast. 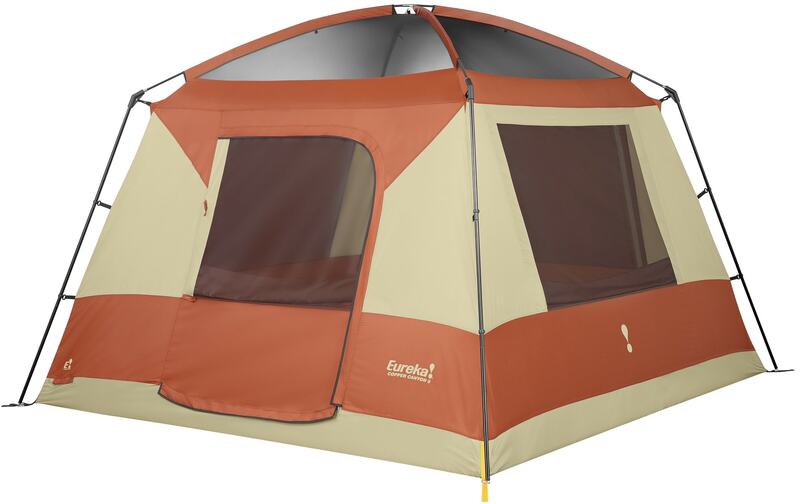 The tent's free standing and shockcorded fiberglass and steel frame is easy to set up. Clips secure the tent body to the frame. Price, size of tent and cheaper than amazon. Plus I like the way it is made and other feedback which was positive. Easy set up, recommendation from a friend. I've had good experiences with Eureka tents for many years. I friend of mine has this exact tent and it's just what I'm looking for size-wise. i had it before and it was a great tent! the windows will not open up completely, however, they do zip up to provide privacy and rain resistance. Sorry to delay you. You have had this tent long enough that obviously any warranty will not help. 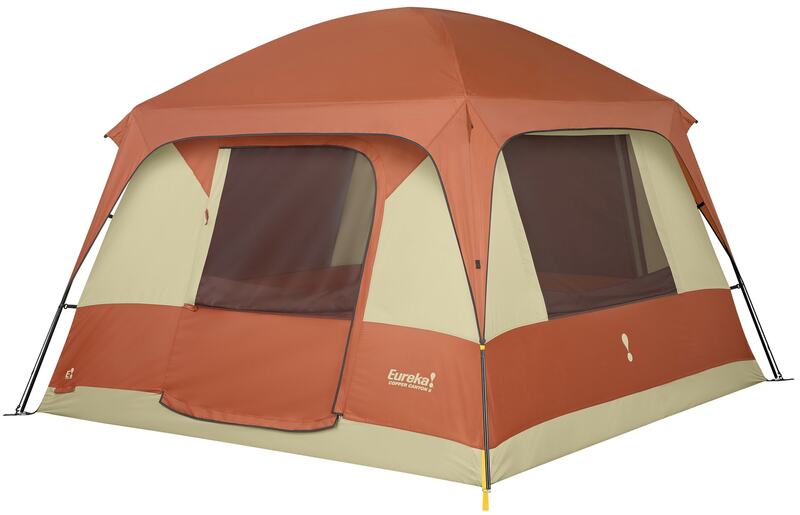 To get the best way to maintain your tent you may want to contact Eureka themselves. I will ask around though, and if I get a sold idea I will post back. Can you get the zipper on The door replaced? Check with our warranty department: 1 (800) 409-7669. They can put you in touch with the right people at Eureka. Does this tent come with a carrying bag? BEST ANSWER: Yes, It has a stuff sack.